Give your customers a taste of the US by putting some guest US craft beers on and changing it up for the weekend. There's a great range of American craft beers available so choose a selection that showcases the skill of our micro-brewing friends from across the pond. Tap Takeovers are a great way of bringing in a big crowd of enthusiastic beer drinker to try new and exciting beers. We suggest you put on an American IPA such as Fordham Route 1 or Saugatuck Backyard IPA, a definite crowd pleasing (and best selling) Fordham Gypsy Lager and any others you know will go down well with your crowd. If you want to focus on one particular American brewery for your Tap Takeover, Fordham & Dominion has a choice of 6 draft beers ((including IPAs, APAs, Ambers, Lagers, Wheats and Stouts) as well as complete POS package to make life easy for you: elaborate wooden tap handles, brewery tackers, posters, glassware, flyers, menus and branded buckets for bottle deals. It couldn't be simpler - we'll give you everything you need to go! Get in touch and we'll help you organise a Tap Takeover at your bar. The whole venue can go American for the weekend to celebrate American Independence. Share a selection of some of the best US craft beers with your customers on a special July 4th beer menu. Offer samples and taster deals to encourage people to try new styles of beer. Showcase the best America has to offer with bold, hop forward West coast American IPAs, smooth creamy Blonde Ales, malty, refreshing East coast lagers and funky experimental peanut butter milk stouts. There are so many greats, they won't be able to help trying them all! Choose your best US influenced dishes on the menu or let the chefs cook up some delicious American pancakes, ribs and burgers to create a brand new food menu to accompany all the beers you'll have on offer. Put on the country music, hoist up the stars and stripes, marinade some meat, chill some beer and get partying American style! Create a killer offer of a bucket packed with seasonal American craft beers. Either let them choose their own from your beer menu or offer them a choice of your own: a Summer bucket (Dominion Cherry Blossom Lager, Fordham Wisteria Wheat Beer, Dominion Gigi Farmhouse Ale, Fordham Gypsy Lager & Saugatuck Oval Beach Blonde Ale) or a Classic American IPA Bucket (Fordham Route 1 Session IPA, Fordham Rams Head IPA, Saugatuck Backyard IPA, Tailgate Sorta IPA, Tailgate Grapefruit IPA). It's a great way to give customers something more for their buck as well as increasing your spend per head. 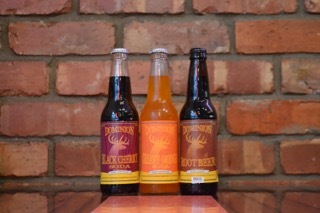 Don't forget the kids and non-beer drinking crowd and get in some authentic US sodas - we've got the nations favourite Dominion Root Beer as well as Black Cherry and Creamy Orange Sodas. We've some incredible beers that fall on the 'experimental' side of craft whilst firmly retaining their quality. Stocking these over July 4th will both intrigue and delight your beer loving customers (which, let's face it, is everything these days). Tailgate Peanut Butter Milk Stout was undoubtedly the most talked about beer at Craft Beer Rising earlier this year and for good reason too. People were desperate to try this brand new beer and, once they finally got hold of some, it disappeared rather quickly! We're also very excited to be getting some Grapefruit IPA from the same brewery. A perfect Summer beer and will delight those that look for something a little leftfield. Be one of the first UK bars to stock these highly anticipated new brews in cans and watch them fly out! We will also have Saugatuck Neapolitan Milk Stout and Dominion Grapefruit Pale Ale available on tap for the flavour junkies out there. Happy July 4th planning! For any more information on any July 4th events or to order sample stock or POS, please get in touch today.